Players who departed Altrincham during 2002-03 season or the 2003 close season. Signed from Hednesford Town at the end of August 2002, Adewale Ajetunmobi is a speedy Nigerian striker with experience at Queen's Park and Hamilton in Scotland and, in England, at Chester City as well as at Hednesford Town for whom he played several games in 2001-02 in the Dr Martens Premier League. Before joining Altrincham he had most recently been training with Lancaster City. Adewale is pictured, right, warming up before his debut as a late substitute against Burscough on 3 September 2002. "Ajet" left the club for Witton Albion in the second week of October 2002 after making just four substitute appearances. He soon moved to Vauxhall Motors, where he was a fringe player, before being released in February 2003. Signed for Droylsden in August 2003 but released in early September. Appearances 0(+4), goals 0. Signed in October 2002, Chris was previously at Carlisle United and also played local football in the Barrow area. He made his debut under Bernard Taylor in right midfield on 8 October 2002 against Vauxhall Motors but was released at the end of October following Graham Heathcote's arrival as manager. Appearances 1(+1). Jordan Burke (right) made his debut at Colwyn Bay on 28 December 2002, after signing fron NW Counties' side Flixton. A versatile young player, he started his debut in central midfield and, later, played in central defence. Jordan's previous clubs include Southport, from where he moved to Kendal Town in March 2001 and Vauxhall Motors, where he went from Flixton in August of 2002 before returning to Valley Road. Played 7(+1) games for Alty before deciding he could do better elsewhere and signed for Skelmersdale United in early March 2003. Almost immediately picked up a serious injury but returned to play briefly for Skem in 2003-04 before decamping to Burscough in early September 2003. Tony signed from Salford City shortly before the postponed Accrington home game on 7 March 2003. He had previously been at Aston Villa, Blackburn Rovers and, after several years out of the game, at Trafford. He is a right-back/midfielder and after recovering from a thigh injury finally made his debut as a midfield sub for the three minutes of added time at Accrington on 12 April. Moved on after one of the briefest Alty careers on record but by 2005-06 had joined FC United of Manchester. Career appearances for Alty at June 2003 - 0(+1), goals 0. Matthew was a young right-back from Rochdale Reserves who made his Alty debut, on loan, on 1 October 2002 at Lancaster as a substitute centre-back. He made one start and 2 sub appearances in total. After leaving Alty he was released from Spotland and in the second week of February 2003 joined Hyde United. Moved to Salford City for 2003-04. Picture courtesy of Alan Johnson. Francis is a tall midfielder from Merseyside who played for Alty Reserves and Youth teams in 2002-03. He made his first-team debut as a sub in the UniBond Cup in November 2002. He is pictured on the left of the adjacent picture with Jon McEvoy, playing for the Altrincham & District F.A. side. Career appearances for Alty at June 2003 - 0(+2), goals 0. Stuart signed on non-contract terms in early October 2002. He was formerly at Stockport County as a youth player (c.1999-2000) but was out of action, injured, for some time before joining Altrincham. He made just one sub appearance for The Robins. Danny is a young right-back, who was at Alty as a youngster and returned to play at Moss Lane during the 2002-03 pre-season but never got to play for the first team (December 2002). Returned briefly to Altrincham Reserves c.2004. Jason (seen, left) spent most of his Altrincham career as a pacy and hard-working midfielder who generally operated on the right. However, he was originally signed by Altrincham from Hyde United as an understudy for George Shepherd at right-back and, indeed, Mark Ward played Jason as a full-back in 2000-01 as well as in midfield. His former clubs include Marine, Witton Albion, Northwich Victoria, Runcorn and Caernarfon Town, as well as Ternia in Belgium. Despite his lack of inches he is an extremely good header of the ball. Jason, who arrived at Moss Lane in September 1998, was a key component of the 1998/99 promotion side. However, injury blighted his last three years with the Robins. He pulled a hamstring at Worksop (Sept. 2000) but after returning to the side picked up a nasty double injury at Bamber Bridge (25/11/00) in his 100th appearance for Alty. Jason was injured again in January 2001 but returned to the first team, only to be sidelined by injury once more (March 2001). He underwent a hernia operation in December 2001 and after trying a comeback, he was ruled out for the rest of the season. With his friendly attitude to supporters, Jason was one of the most popular players at the Club. In 2002-03 he returned to first-team action but injury again restricted his appearances. However, he was in action again in 2003/04 pre-season games but, though offered terms for 2003-04, he elected to leave the club on 15 August 2003. Appearances - 150(+27), goals 9. Formerly at Maine Road FC (NW Counties League), Anthony was a talented and speedy striker/midfielder who made his first-team debut as a substitute in the UniBond Cup at Runcorn on 26 September, 2001. Before then he had impressed in pre-season and Reserves' games for Altrincham. Anthony also played impressively as a substitute striker in the Trophy replay versus Spalding on 6 November 2001, and in subsequent cup games. He scored his first senior goal against Woodley Sports in the Cheshire Senior Cup. He went on loan to Bamber Bridge (Jan. 2002) but then was allowed to stay there permanently - even playing against Alty in April 2002. In summer 2002 he joined Hyde United, playing for their first team in 2002-03 season against Alty. Anthony left Hyde and rejoined Altrincham in early December 2002. He made 1(+8) appearances and scored two goals for Altrincham in his first spell at the club (2001-02) but left without adding to this total in 2002-03, joining Trafford. After spells at various clubs he had settled at Cammell Laird by 2005. A left-winger released by Blackburn Rovers at the end of 2001-02. Ryan impressed in the pre-season games and signed for Alty just prior to the start of the 2002-03 UniBond season but left to play 20 minutes for Carlisle United on the opening day of that Nationwide League season. He returned to Alty but only played two games for the Robins before being released and surfacing at Mossley in September 2002. He then went to Hyde United briefly, before making his debut for Trafford in the UniBond First at Chorley on 25 January 2003 but soon moved on again. Appearances 2, goals 0. Kevin, is a versatile midfielder who can also play up front and as a central defender. He originally signed for Alty, along with Mark Sertori, on 25 July 2001 but left at the end of the season. He re-signed at Moss Lane on non-contract terms on 7 October 2002, after turning down a more lucrative move to Leigh RMI. However, when his friend Bernard Taylor was almost immediately sacked as manager, Kevin moved on to Hyde United in mid-October after just one start for Altrincham. In summer 2002 he had gone to Mossley but did not play through injury. His career started at Radcliffe Borough before he joined Bury and then Chester. Then, after 34 league games for Doncaster Rovers (8 goals), he returned to Gigg Lane for the same £45,000 fee which had taken him to Yorkshire. He played 139 games in all for Bury. Next, he signed for Lincoln City (5 starts) and, after a spell at non-league Macclesfield from Christmas 1995, he joined Halifax Town (33 games and 4 goals), where he became the team captain. He won a Trophy Winner's medal for Macclesfield and has also played in a Wembley play-off for Bury. Kevin followed his former Halifax team-mate, Mark Sertori, to York City in September 1999. At York he started 38 league games and scored 7 goals but he was out for two months with a hernia operation and suspensions. In all, he has played 253 League games and netted 40 goals. Kevin proved a very useful and versatile acquisition for Alty in 2001-02 and was the leading scorer of outfield goals for Altrincham that season. Total appearances for Altrincham to November 2002; 51(+1), goals 15 (13 league + 2 cup). Signed by Altrincham in early September 2002, Spencer had previous experience at Swindon Town and Wealdstone. He left the club without making any appearances but returned to Altrincham Reserves in 2004-05 before moving on again. Andy (right) is a skilful central midfielder who signed for Altrincham from Witton Albion in late July, 2002 for a small fee, reportedly provided by a club benefactor. Andy had previously played for Ashton United, Woodley Sports, Winsford United and Abbey Hey, as well as for the East Levenshulme Sunday league team. He scored his first goal for Altrincham in the friendly match at Abbey Hey on 20 July 2002. After seeming to establish himself as aregular, Andy was mainly used as a substitute following the departure of Bernard Taylor. He was released in mid-January 2003 after 18(+6) games in which he scored 3 goals. In mid-February he joined Kidsgrove Athletic and then had various clubs including Woodley Sports..
Andy May (right), the former Manchester City midfielder and assistant manager of Halifax Town (1998-99) was appointed as Alty coach in the 2002 close season. Andy's previous job was as youth coach at Wigan Athletic (till July 2001). He was born at Bury on 26 February,1964 and played for Manchester City from 1982-87, making 141 League apps (+9 as sub) for The Blues. He scored 8 goals for them. Andy has also played for Huddersfield Town (73 games, 5 goals) and had a spell at Bolton Wanderers on loan (10 games, 2 goals). 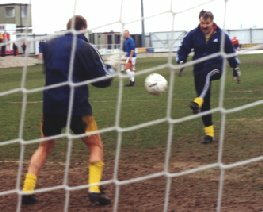 Before joining Alty he had also been playing Masters football and doing some match reporting for the Press Association. Andy was dismissed along with manager Bernard Taylor on 14 October 2002 after a poor run of results including defeat in the FA Cup. Andy is a young keeper who was signed on the eve of the 2002-03 season from Squires Gate. He made his debut against Gateshead on 26 August 2002 and put in a number of good performances before being unfortunate to lose his place to Richard Acton. He moved to Trafford in early November 2002 but soon moved on. At start of 2003-04 he was at Abbey Hey. Appearances 7. Neil is a right-back who made 6 starts for Blackpool's first team in 2000-01 and 1 in 2001-02 before being released. He joined Alty during the 2002-03 pre-season, when he impressed. Neil was originally a trainee at Liverpool and has won England Youth honours. He also had a brief spell at Luton Town on loan before joining Altrincham. Neil was released after twelve starts, on 25 October 2002 and joined Marine, where he went into the first-team and was still there in 2005-06. Appearances 12(+1), goals 0. A very fast left-sided player, who joined Altrincham in late September 2002. After a brief substitute's appearance, he was sent off in the next game, on his full debut, against Kendal Town in the FA Cup on 28 September and was released immediately. Reportedly once at Manchester City and Bolton Wanderers he was at Stafford Rangers in 2004. Appearances 1(+1), goals 0. Whiston-born James made his Alty debut, on loan from Crewe Alexandra, on 2 December 2002 at Marine. However, a collision resulted in a lost front tooth and substitution at half-time as a result of this injury. Returned to Crewe after making 2(+1) appearances. He returned in 2005-06, after a spell with Accrington Stanley but emigrated to Australia in early 2006. Youth-team defender/midfielder who made an impression in the first team in 2001-02 but departed after the pre-season of 2002-03. Went to Nantwich Town. Ian was signed from Stalybridge Celtic as a cover keeper in late January 2003, for his third spell at Moss Lane. In 1999 he joined as cover for Dean Greygoose having played for Altrincham in the 1980s and became, at 39, the Conference's oldest current keeper when he substituted for Dean Greygoose against Welling on 8 January, 2000. This was his first appearance for the team since 1983 and he can therefore boast that he did not concede a goal for Altrincham over a period of 18 years! This record was lost at Witton on 4 April, 2000 when he played the full match in the Cheshire Senior Cup Final, which was won by Macclesfield Town, 2-1. Ian has been on the books of more than 30 different clubs during his career and is now a respected goalkeeping coach. He is seen right, shooting at Greygoose at Hednesford in 1999-2000 season. In 03-04 Ian was in Stalybridge's squad against Southport at the age of 43! Ian is now owner of Sensports, a company supplying sportswear and kits; his customers include Altrincham FC. Nick is a former YTS goalkeeper from Torquay United who appeared on the bench for the Devon side's first team 12 times in 2001-02. He left after only being offered a three-month contract over the summer. Nick played well in pre-season and played the first three games of 2002-03 season. However, he was then dropped and left the club in early September 2002. Joined Hyde United in early December 2002 but apparently soon moved on again. Appearances 3. Tony (right) signed from Southport in mid-January 2003. A speedy forward/winger, he had joined Southport in July 2001 from Stalybridge Celtic. In doing so, he followed Celtic manager Phil Wilson, who had moved from the Bower Fold to manage at Haig Avenue. Tony joined Stalybridge in September 1997 after playing for Prescot Cables and in Merseyside local football. Tony scored his first goal for Alty on 8 February 2003 against Blyth but his starts were restricted by a lack of match fitness. He left to rejoin manager Phil Wilson at Lancaster City on 22 July 2003. Career appearances for Alty at June 2003 - 7(+7), goals 1. Manager Bernard Taylor had his contract terminated on 14 October, following a run of eight games without a win, including an exit from the FA Cup at Guiseley. 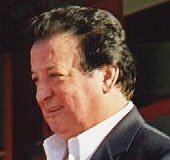 Bernard's first spell as manager (1998-2000) had seen five trophies won. His side gained promotion to the Conference but were relgated after just one season in 1999-2000. Bernard resigned at that point but resumed the post in spring 2001, after the sacking of Mark Ward. However, success in the FA Cup in 2001 was followed by a marked dip in the second half of the season, from which recovery never fully came. Bernard was a popular figure with supporters but sadly the success of his first period in charge could not be recaptured. Bernard became manager of Kidsgrove Athletic in late March 2003 but left there svereal months later. Andy was a young former Manchester City wide midfielder who broke his leg whilst on loan in his first start for Altrincham (v. Hyde) on 26 March 2002. He recovered fitness at Moss Lane and returned to competitive action mostly as a substitute in 2002-03. He finally made his starting debut in November 2002. After a spell at Trafford, Andy returned for the Alty game at Bradford on 29 March 2003. He is a speedy and hardworking player who will hopefully consolidate his position in 2003-04. Andy turned down terms for 2003-04 as he wished to secure regular first-team football. Career appearances for Alty - 6(+18), goals 0. A tall striker, released by Mossley at the end of 2001-02. His previous clubs include Maine Road, Witton Albion, Mossley, Winsford United, Trafford, Hyde United, Witton Albion, Trafford, Mossley, Ashton United and Wythenshawe Amateurs. Mike played in pre-season 2002 and scored twice at Flixton but was not retained. He then moved to Flixton by September 2002 and in January 2003 moved on to Salford City. By pre-season 2003/04 he was at Trafford once more. Appearances 0(+2), goals 0. Something of a mystery player, Andrew was signed from Bolton Wanderers by Bernard Taylor in early October 2002, but never played before being released by Graham Heathcote at the end of that month. Appearances 0. Simon is a young right-sided midfield player who impressed during this season's pre-season friendlies. He was formerly at Ramsbottom United and Cheadle Town. Simon played in most of the early league games of 2002-03 either from the start or as a sub but he was sidelined in late September 2002 by a broken bone in his foot, sustained in a workplace accident, which left him on crutches, but returned to action in late November. Went on loan to Flixton in December 2002 and moved to Salford City in January 2003. Became a regular right-back for Trafford and was still there in 2005/06. Played 4(+7) games for Altrincham. Chris is a midfielder/striker who had a spell with Altrincham as a youngster but only ever got to be an unused substitute for the first team. He also has experience at Mansfield Town where he suffered a broken back which sidelined him for a long time whilst on loan to Macclesfield Town. He recovered fully and rejoined Altrincham for 2002-03 after playing at Flixton, Droylsden, Curzon Ashton and, finally, Hyde. Chris's Alty league debut was on 17 August 2002 against Harrogate Town. He is a good holder-up of the ball and his best position is probably in central midfield rather than as a striker. After participating in all of Alty's first 18 games of he season, he was released on 25 October 2002 following the change of manager at Moss Lane. By 2005-06 he was captaining Woodley Sports in the UniBond 1st Division. Appearances 15(+3), goals 3.